The leading conference for web designers is back in NYC – and right now you can get a ticket for half price. For those who don’t know, generate is a conference for web designers that boasts a host of top-quality speakers and workshops. This year the NYC event is set in the salubrious surroundings of the TKP New York conference center on 109 West 39th Street and only 10 minutes from Grand Central and Penn Station. So who’s appearing in this year’s line-up? CSS layout legend Jen Simmons, UX design leader Josh Clark, CSS Houdini magician Sam Richard, Susy creator Miriam Suzanne, author and CX aficionado Jim Kalbach, OOUX evangelist Sophia Prater, design technologist Adekunle Oduye, girlscancode.io creator Kasey Bonifacio, Sparkbox founder Ben Callahan, co-founder of Anton & Irene, Irene Pereyra, and problem-solving design director Aaron Irizarry are the big names that are set to make generate NYC 2019 a raging success. For three days only you can now get a whopping 50% off the price of a standard ticket. So what does that mean in real terms? You can get a whole day workshop for just $149.50, while you can get to see and hear eight expert speakers for just $199.50. Check below for the full price list. What do you need to do? Visit the generate website and input discount code GENERATE50 when prompted. But be quick, sale ends 2100 (EST) on Monday 1 April 2019. The generate conference runs over two days with the first day running four top notch workshops simultaneously. Sign up and you get to spend eight hours with an expert in a small group ensuring you get plenty of insight and the chance to ask as many questions as you want. Miriam Suzanne brings you her Advanced CSS for Modern Applications workshop. What will you learn? How to use modern CSS features including custom properties (variables), calc, grids, flexbox, writing modes, advanced media & support queries and how to write Sass & CSS for design systems and pattern-library automation. Jim Kalbach unleashes his Design and Innovation Sprints workshop, which once finished you will have the skills to plan and set-up a sprint, have the confidence to run a design sprint and understand what to do with the results of a sprint. Sophia Prater brings her Object-Oriented UX: Simplify your pixels and your process workshop to generate NYC. What will you learn? The psychology of object-oriented UX and why it speaks to our lizard brains, the four biggest user experience fails (and how to avoid them) and the art and science of object mapping: how to structure a product with the power of OOUX. Finally, we have Ben Callahan and Kasey Bonifacio with their Making Design Systems Work workshop. What will you learn? How to evaluate your system design needs, convince others of the value of a design system, how to roll out and deliver strategies and much more. Day two of generate is speaker day. This brings together eight industry experts who will give you an insight into their world. The opening keynote belongs to Josh Clark with AI is your new design material, while the closing keynote belongs to CSS layout expert Jen Simmons who will present her Everything You Know About Web Design Just Changed. Check the full agenda for dates and times. Don't miss out. 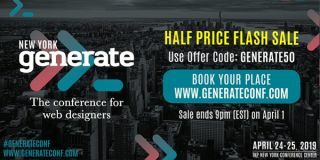 Head over to generateconf.com and sign up now.